Recent release “Rooster in Two Barnyards” from Page Publishing author Mary Washington is an 11-year-old girl’s poignant struggle to understand the tapestry of rich cultural traditions in her community. These observations are revealed through friends, family and neighbors including Rooster, whose charisma and striking, unforgettable presence teaches her that though the community lacks financial riches, it is a living organism thriving on colorful, vibrant relationships. Mary Washington, one of ten siblings and the first in her family to gain a college education, has completed her new book “Rooster in Two Barnyards”: the eye-opening story of an 11-year-old girl’s struggles to learn about all the rich cultural traditions in her community. Published by New York City-based Page Publishing, Mary Washington’s tale demonstrates how even though a community may lack financial riches, it is often still vibrant, thriving and full of priceless information and life experiences that are far more valuable than financial wealth. 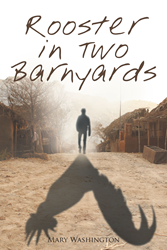 Readers who wish to experience this inspiring work can purchase “Rooster in Two Barnyards” at bookstores everywhere, or online at the Apple iTunes store, Amazon, Google Play or Barnes and Noble.